Guest vocals on War Of Dragons by Anette Olzon. Since the recording Pelle Åkerlind is no longer the drummer and has beeen replaced by Kalle Löfgren. 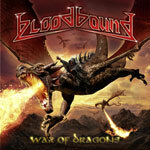 Bloodbound have been releasing solid album throughout their career, and especially the past seven years. Stormborn (2014) I found to be a great piece in the classic, modern melodic heavy metal genre and to no surprise they continue on their beaten path this time around. One thing that drags this album down is the fact that in four songs (Battle In The Sky, War Of Dragons, King Of Swords, Symphony Satana) I hear the same chord progression and vocal lines as in one of their previous songs (Iron Throne), which in turn is quite similar to Nightwish's Wishmaster. It is mostly not the bearing part of the song but enough prominent to be a disturbance, frankly. And when I only mention four songs I am being nice. Apart from that, this album is a bit more light and melodic than lately, more leaning to the power metal side than the heavy dito. Plenty of great melodies and adequatly portioned riffs mostly in a sweaty and forceful tempo but focusing more on the lead guitar and keyboard harmony than the riff, so to speak, all in line with the all-in on the dragon lyrical themes this time around. As always with this band it is well produced with a fat, yet crisp and clear sound landscape. Patrik J Selleby's great vocals sit very well on top of it all and combined it creates kind of a grand and massive feeling. Overall well executed, but I feel it is a bit light weight compared to the past couple of albums plus the fact that too many parts sound too familiar.